This is a fun and easy challenge and I want to see that gallery filled with projects! You've been collecting the Friday Freebies, put them to use and play along with this challenge...You could win FREE digital stamps of your choice! For this challenge, I decided to color up one of 'my girls'...I am featuring Winter Wonderland Diva. When she was first released, I just didn't have time to create anything with her. Soooo...here she is. Click on the images to enlarge them. The Divas just make me smile! I printed this beauty onto white card stock, die cut it and dusted on blue ink while it was still in the die. Then I colored her with Copic markers. I didn't have a die to cut the size mat I wanted for my focal piece, so I buzzed over to the Silhouette store and picked up a really nice cut file that has various sizes of oval scallops and insides. Click HERE to see it. I created my background paper by die cutting various snowflakes and adhering them to white card stock. I embossed the snowflake studded paper to create texture. Next, I added my bling and things. I went a little crazy with the bling and things! Ok...First, I went over all the lines with a clear glitter pen. Then, I used Sugar Sparkly Fluff on the fur sections. Next, I adhered tiny twinkles to her necklace and sprinkled a few around the image,too. I added some Pretty Pink Posh sequins and topped them with rhinestones. And finally, for the pom poms on her muff, I cut down a larger pom pom and rolled these smaller ones and adhered them onto the image. I put Glossy Accents on her lips and the little hearts. I had soooo much fun with this! 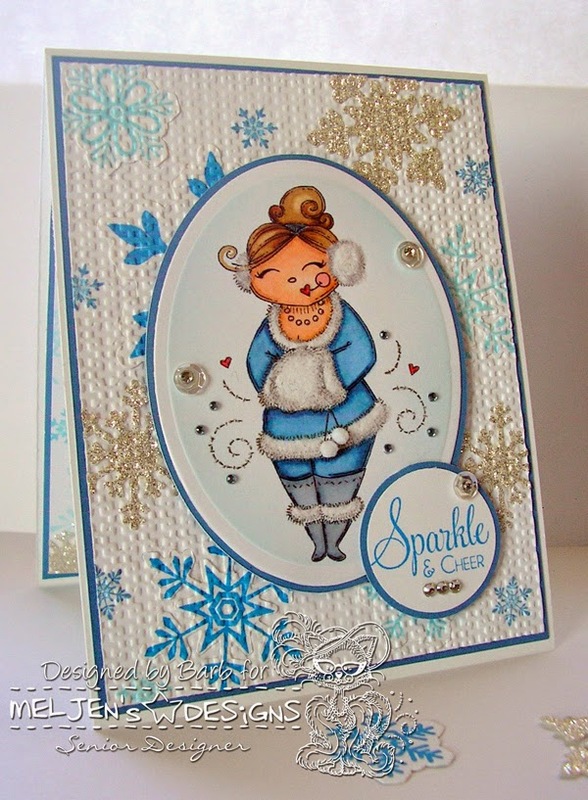 More of those cute random stamped snowflakes and then a sprinkling of the sparkly flakes that I punched. I added a sentiment and a tiny strip of the blue card stock, because I felt that the inside was a little stark with all the white. And that was it...my card was finished! I hope you will make time to join us this week...Come On!...It's ANYTHING GOES! As always, I ask that you please take a moment to visit the Design Team blog to see what the ladies have created to share with you. We've got some new Team Members, so go check them out! And here's some really good news...Pretty Pink Posh sequins are NOW available at Simon Says Stamp! Click HERE to see all the pretty color choices. AND...Simon Says Stamp has a new website...it's definitely a must see! It's nicely organized and very easy to navigate. I LOVE IT! That's it for me today. I will be back tomorrow with the Friday Freebie. I wonder what Melissa is going to treat us to next! Thanks for stopping by! Make it a great day! Holy smokes, Barb! This card is fantastic! You've really outdone yourself here. I adore all the sparkle and bling. But those muffs and puffs...they really stand out. Wow! Fabulous work! Love your card Barbara, these colours blend so well together. Beautifully embellished and Diva is gorgeous. What a beautiful card. Love how you did the background.